Fig. 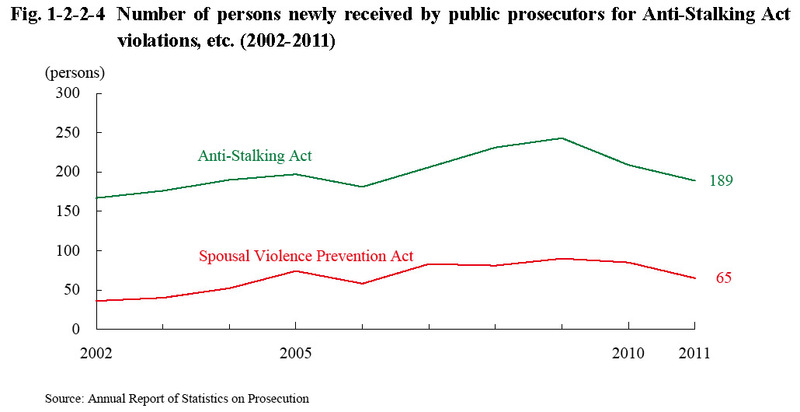 1-2-2-4 shows the number of persons newly received by public prosecutors for violations of the Anti-Stalking Act and the Spousal Violence Prevention Act over the last 10 years (See Appendix 1-4). Both the numbers were on an increasing trend, but both turned to follow a decreasing trend from 2010. In 2011 the number of persons received for Anti-Stalking Act violations decreased by 9.6% from the previous year while that for Spousal Violence Prevention Act violations also decreased by 23.5% (id. ).